Thomas Tredgold, English railway engineer and writer, mid 19th century. Joseph Bancroft Reade, English chemist and microscopist, mid-19th century. George England, English locomotive maker, mid-19th century. Sir Francis Ronalds, English electrician and meteorologist, mid-19th century. Sir Arthur Cayley, English mathematician, mid-19th century. Sir John Hawkshaw, English engineer, mid 19th century. Chinese mariner's compas, mid 19th century. 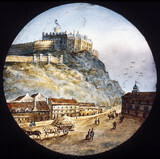 Castle on a hill, mid 19th century. 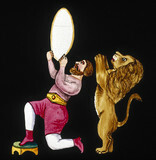 Man and a standing lion, mid 19th century. 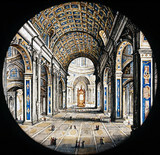 Interior of an ornate building, mid 19th century. Couple with a baby, mid 19th century.